Recent release “Tragic Boulevard” from Page Publishing author teresa joiner is a book of soulful poems shared to offer healing and recovery after emotional trauma. Teresa Joiner, a poet, short story, and children’s book author on her own journey of self-discovery the darkest moments of her life, has completed her new book “Tragic Boulevard”: a potent compilation of poetry that lays bare the deepest agony of a wounded soul. Published by New York City-based Page Publishing, Teresa Joiner’s raw, emotional poetry strikes a chord and offers hope and healing through self-expression. 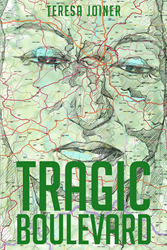 Readers who wish to experience this searing work can purchase “Tragic Boulevard” at bookstores everywhere, or online at the Apple iTunes store, Amazon, Kobo, Google Play or Barnes and Noble.